The Appalachian Mountains Young Forest Initiative centers on Bird Conservation Region 28 and includes southern New York, much of Pennsylvania, western Maryland, West Virginia, and parts of Ohio and Virginia. A stepdown of the Woodcock Conservation Plan for the Appalachian region outlines habitat goals. In the past, this area had some of the best breeding habitat for woodcock in the species' range. But development by humans and the gradual changeover from brushy forest to mature woods has cut deeply into the number of acres available to woodcock and other wild creatures that need young forest and shrubland to thrive. More than 25 Demonstration Areas have been set up to showcase habitat management techniques that help woodcock and other young-forest wildlife. Partners include the U.S. Fish and Wildlife Service; Doris Duke Charitable Foundation; Natural Resources Conservation Service; National Fish and Wildlife Foundation; U.S. Geological Survey; American Bird Conservancy; Northeast Association of Fish and Wildlife Agencies; fish, wildlife, and conservation agencies for New York, Pennsylvania, Ohio, Maryland, West Virginia, and Virginia; Forest Investment Associates; the Ruffed Grouse Society; Woodcock Limited of Pennsylvania; and the Wildlife Management Institute. A key partnership is the collaboration between the Woodcock Task Force and the Golden-Winged Warbler Working Group. The population of golden-winged warblers is also falling in the Appalachian Mountains, likely due at least in part to habitat loss. Biologists have developed a set of Best Management Practices to benefit woodcock, golden-winged warblers, and other young-forest wildlife in the Appalachians. There are both effective and ineffective ways to try to create woodcock habitat. 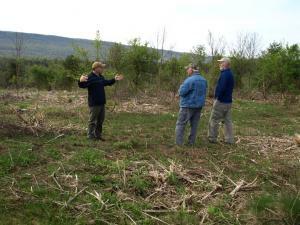 Context of Management gives guidance on where, and where not, to actively manage land for woodcock.